PennsylvAsia: The Power of Two at Sewickley Academy, January 12. 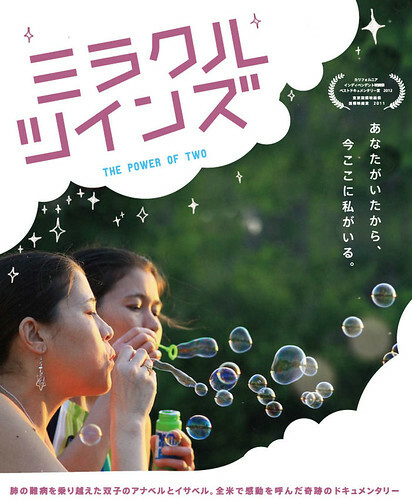 The Power of Two at Sewickley Academy, January 12.
follows them on a trip to Japan in 2009 to meet with donor families and recipients, and advocate to raise Japan’s still-low organ donation rate. The two are natural storytellers, compelling and poetic on the power of human connections—as twins, biracial Americans, and organ recipients almost mystically tied to their donors. Mr. Smolowitz makes their post-transplant vibrancy—they climb mountains, run, swim—all the more exhilarating by first showing, through archival footage, how they more than paid their dues through countless hospitalizations and surgeries since they were babies. From the viewpoint of Japan, where only 193 transplant operations were performed in 2009, compared with nearly 28,000 in the twins' native United States, they were the "miracles" of the film's Japanese title indeed. The "Miracle Twins" (ミラクルツインズ) website has a larger summary, additional resources on the movie and the background, and a collection of reviews and awards-won. The movie is actually available for free Hulu, and at a price via other online sources.